Selling a home is stressful in itself, but when you or your realtor are planning an open house during the holidays it can become downright overwhelming. Many people recommend waiting until after the holidays before showing a home, but others think that it is actually a great time to sell because potential buyers will typically only take time out from their holidays to attend an open house if they are truly interested. So showing your home during this busy time of the year may be beneficial. To help relieve the stress, here are a few tips to help you have a stress-free showing of your home during the holiday season. Winter is typically the season when most people want to stay indoors, but selling your home during the holidays means you may have to adjust your schedule. Keep in mind that buyers who are looking at homes during the holiday season are usually seriously considering buying. 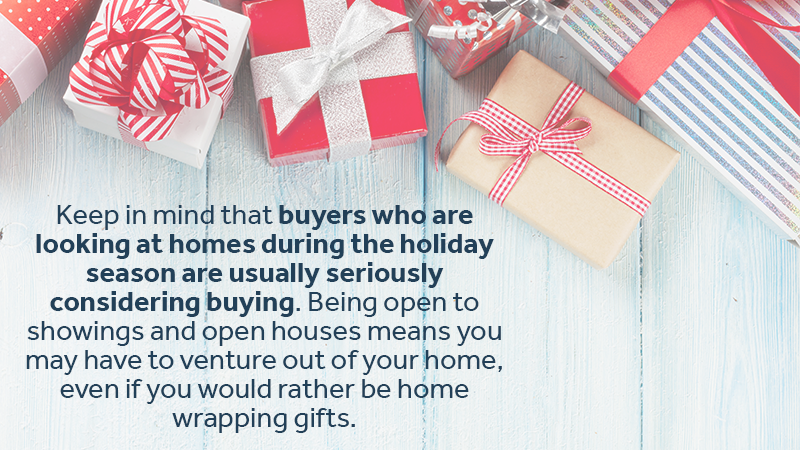 Being open to showings and open houses means you may have to venture out of your home, even if you would rather be wrapping gifts. 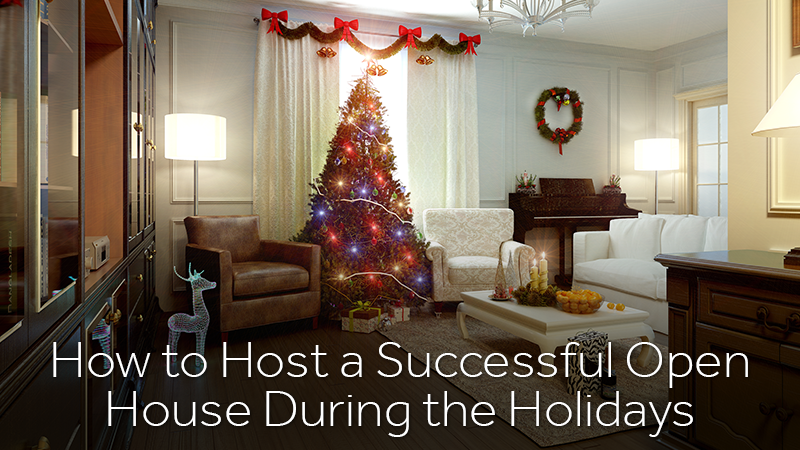 If you typically host a holiday party, it may be best to work with a family member or friend and agree to help them with hosting this year’s party. This will ensure that you won’t be in middle of an event when your realtor calls and informs you there are buyers interested in touring your home at the last minute. If you have no other option than to host the party, make sure you contact the real estate agent to let them know the property in unavailable to show on the date of your party. Instead of using a full-size tree, consider decorating a smaller version or even a table top tree. Either stack the presents in a corner or place them in a closet until after the open house. Consider using more red than green in the decorations, because red is an emotional color. Avoid hanging large banners and instead use fresh greenery, such an evergreen garlands. Keep centerpieces simple. For example, create wintry centerpieces from pine cones and other pieces of nature. Keep a plate of fresh baked cookies on a counter for guests. Make sure the exterior is clean and opt for simple decorations, such as a door wreath as opposed to large, inflatable yard decorations. Remember, potential buyers will look through everything, so it is important to keep the house clean and orderly. Most realtors also recommend removing all personal items, such as photographs, collectibles and other belongings. This will allow buyers to picture their life and things in the home. To help make moving easier and to ensure all of your personal items are packed away during showings, contact Zippy Shell. We can pick up your belongings and store them until your moving day. Give us a call to learn more about how you can declutter for showings and save $20 with our winter special! For longer terms, you can save up to $50 with free initial delivery for storage of up to six months.